One day the Bear and his friend, the Small Pig, were strolling through the wood, and the Bear was just beginning to think he might like some honey, when, rather suddenly, the fair weather ended and the forest became very dark indeed, and very cold, and quite unfamiliar. It had been, the Bear thought to himself, quite an enjoyable walk up until this point. “Are we lost?” asked the Small Pig. “Oh good,” said the Small Pig. “Could we have haycorns, too?” asked the Small Pig, who was quite partial to acorns. “Certainly. In moderation,” said the Bear, how rather preferred honey but virtuously considered it a matter of personal choice. The Small Pig was rather pleased by this, but still seemed a little uncertain. 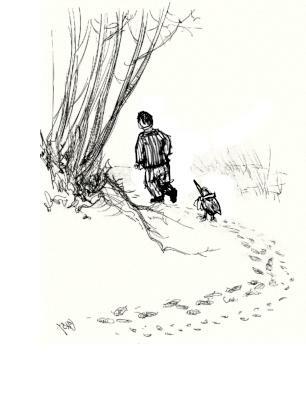 “Are you sure we oughtn’t try going… back?” asked the Small Pig quietly. “Do you want your haycorns or not?” asked the Bear. So off they went, forwards, and slightly to the right. After a while, it began to snow. The Bear decided that the main thing was that the Small Pig should not loose Confidence. So he decided to sing a Brave Song as they walked. But he couldn’t decide between the song about Small Government And De-regulation, or the song about How Not To Scare Horses, so instead he just hummed in a brave way, and generally pretended to be quite certain they were heading in the right direction. And the Small Pig did begin to feel rather better when he saw this, and started to think he was a Very Brave Small Pig indeed out on an Adventure. And he was feeling quite sorry for anyone out in this weather who didn’t know the right way home, and thinking the snow was quite pretty as it began to settle on the ground and the branches of the trees, when he saw the thing that made him jump up into the air with a terrified little squeal. “Look!” he said, and pointed. There were tracks in the snow ahead of them. The Bear looked at the footprints thoughtfully. “What do you think it is?” asked the Small Pig. 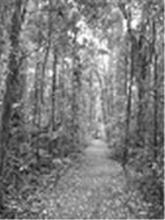 The tracks did indeed follow just the path they were going to take – the prints of four feet, going forwards, and slightly to the right. “We should try to catch up with it!” said the Bear, and immediately set off, with the Small Pig beside him. “What will we say to the Stralia, when we catch up with it?” asked the Small Pig. The Small Pig was looking at the footprints and wondering how fast one had to go to catch a Stralia, when he squealed and pointed again. There was now another set of four footprints along with the first, all of them heading off together, ahead, and a little to the right. The Small Pig was a little bit afraid about which part of the Stralia they might catch up with first. It might be very well, thought the Small Pig, to catch up with a Stralia’s bushy eyebrows (the Small Pig considered bushy eyebrows a sign of a kind nature, and imagined the Stralia had them) or its per capita GDP, but what if one were catch up with its great big teeth first, or its lashing tail, or its environment, or its race relations record? “Is the Stralia very much bigger than us, then?” asked the Small Pig nervously. “It is,” said the Bear. “Oh!” said the Small Pig, not because he understood, but because he’d just noticed even more tracks in the snow and was alarmed all over again. “Are Hoppositions dangerous?” asked the Small Pig. So they walked on, and the Small Pig was so busy checking the shadows for Hoppoisitons he didn’t notice the new tracks appearing until there were quite a number of new ones, at which he almost fainted. “I’m not quite certain this is working.” said the Small Pig, in a tone of voice that said he was rather certain, really, and that he thought it wasn’t working. The Small Pig felt he didn’t want to do that, so off they went again. As they walked along, the Small Pig was thinking that they had surely walked far enough to get home, and that it was definitely time to be sitting down to some haycorns rather than walking though the snow in a Stralia- and Hopposition-infested wilderness. He began to wonder whether, even though the slightly-to-the-right was clearly moving them in a rightwards direction (he imagined they must be quite a long way to the right by now), perhaps somehow the going-forwards wasn’t have the forward-going effect the Bear said it was. The Small Pig was just gathering up his courage to say so, when the Bear spoke. “Oh good!” said the Small Pig, who was so relieved at the idea of not having to worry that he forgot what he was going to say. The Small Pig wasn’t quite sure what the point of all the Urgency was (or whether they were still trying to catch the Stralia) but it certainly meant he didn’t have time to complain, and he had to run quite fast to have any hope of keeping up with what the Bear was doing. And so it was that they both ran headlong into the legs of the Boy. “A Hopposition!” screamed the Small Pig. “Let’s go home and have tea,” said the Boy. “But that’s what I’m trying to do,” said the Bear, and set off again, this time hopping on one leg. 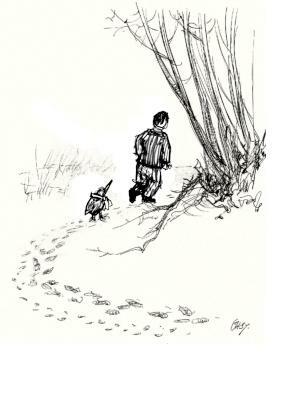 And so the Boy and the Small Pig went home and had tea (and acorns), and the Bear continued trying to make progress while moving methodically to the right. For all I know, he’s still there to this day.